Calabasas, California, USA, Sunday July 22nd, 2012 - The 21st edition of the LA Calendar Motorcycle Show sponsored by Russ Brown Motorcycle Attorneys moved into its third decade as the premier outdoor streetbike event in America featuring its top Celebrity Builders, the Calendar Bike Building Championship & Concours d' Elegance, selected Vendors and Exhibitors, Calendar Girl Music live performances, now taking place at a beautiful new new location on the lawn and under the shade trees of the Calabasas Inn, in the upscale Los Angeles suburb of Calabasas, California. The first decade of the Calendar Motorcycle Show took place at the exciting Museum of Flying at the Santa Moncia Airport, then expanded in 1991 to two days the larger Queen Mary event facility in Long Beach venue alongside the Pacific Ocean. The current 3-year decline in the economy and the resulting impact on the enthusiast motorcycle market with loss of so many custom bike manufacturers, builders, part manufacturers and buyers meant the LA Calendar Show needed to downsize as well, and show producer Jim Gianatsis of the motorsports adverting agency Gianatsis Design Associates and photographer/producer of the world renown FastDates.com Calendars , was excited to secure the Calabasas Inn private event facility as one of the best outdoor event locations in greater Los Angeles. Everyone from the participating bike builders, to venders and spectators were excited about the new grass park location which was next to a creek and duck pond and a huge man-made waterfall, offered an air condition banquet hall where many vendors were also located and had permanent restroom facilities. 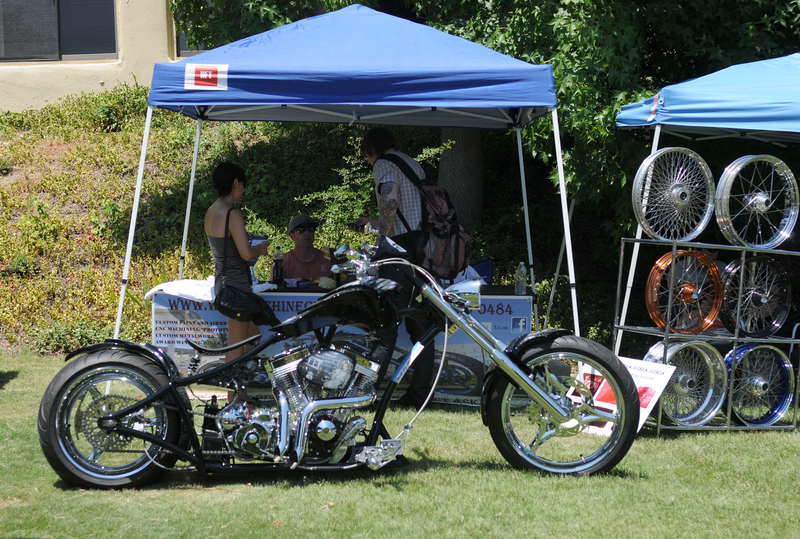 The 2012 Calendar Show was spread across 3 separate wooded areas at the beautiful Calabasas Inn facility. In the background of one display area was a duck pond and waterfall. Anadjoining area just as big under cool shade trees held more exhibitors, the Pro Builder Class, the live band stage with spectator seating, dining tables and food and beverage trucks. And the air conditioned Calabasas Inn Banquet Facility where spectators entered the Show held more exhibitors, restrooms, and the Sportbike Class. 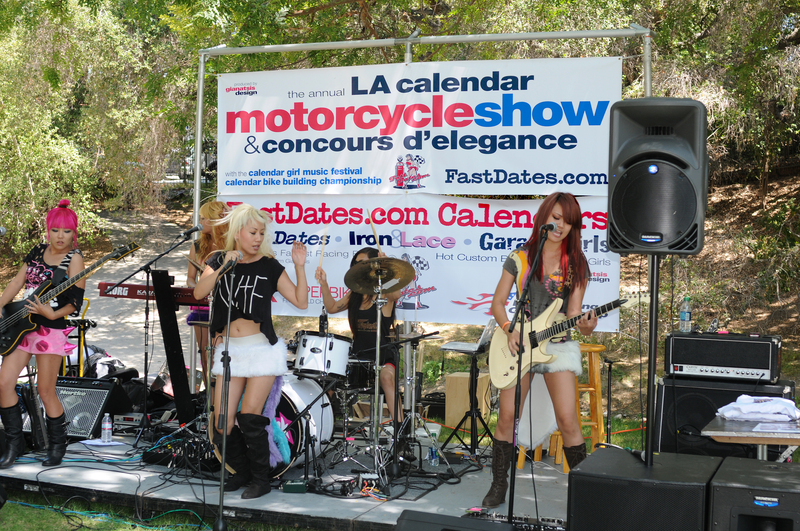 The Show's activities include the Calendar Bike Building Championship, selected Vendors and Exhibitors, the Motorcycle Machine Dyno, and Calendar Girl Music live performances featuring the Japanese girl rock band Nylon Pink, singer songwriters Rachel McGoye and Marina V.
As always the Show marks the world premier of next year's new 2013 FastDates.com Motorcycle PinUp Calendars photographed by Calendar Show producer Jim Gianatsis. The Calendars include Fast Dates World Superbike and MotoGP roadracebikes, Iron & Lace Custom Motorcycles, and Garage Girls Hard at Work, hosted by beautiful Calendar Kittens and SBK World Superbike grid girls Sabella Shake and Kinzy Ray featured in the in the FastDates.com Calendars and Website. The new 2013 Calendars are available now at FastDates.com, Amazon.com, at Cycle Gear Stores and your favorite dealer, or phone Van Leeuwen Distributing at 1-800-461-1226. The Show park was filled to capacity with top industry names including Jim's Machine, Edelbrock Engineering, Frog Specialties / Beringer Brakes, AXO streetbike apparel, and Universal Technical Institute training school. Spectators were treaded to upscale dining on lined covered tables under shade trees, with food and beverages form some of LA's top food trucks - Baby's Badass Burgers, The Grilled Cheese Truck, Maui Waui Hawaiian Smoothies and Sugar Babies Cupcakery. The fresh baked heart topped cup cakes were passed out by the Calendar Kittens complimentary to show spectators. The Calendar Motorcycle Show continues to feature many of the world's top Pro and Amateur custom street bike builders with their newest 2-wheeled creations of rolling art to compete in the Calendar Show Bike Building Championship for fame and awards including the coveted Best of Show Trophy. The Calendar Show broadened its focus to include the growing Collector Bike Market with Exhibitors and Bike Show classes for classic European, British and Japanese motorcycles, along with American V-Twins and Customs. Show Entries were place in a Concours d' Elegance display throughout the venue on the grass and under shade trees at the Calabasas Inn. The Calendar Kittens stop by to visit Todd Silicatio of Todd's Cycles and the Jim's Machine crew to ply them with cupcakes. Among the top custom and racebike builders in attendance and featured in FastDates.com Iron & Lace Custom Motorcycle and Fast Dates Racebike PinUp Calendars over the past 20 years included Russell Mitchell / Exile Cycles and Richard Pollock / Mule Motorcycles, Shinya Kimura / Chabott Engineering, Jim Guiffra & Spokesmodels / AFT Customs, Todd Silicato / Todd's Cycle, Chris Redpath / MotoGPwerks, Caleb Owens / CRO Customs, Yaniv Evan / Power Plant Choppers and Steve Storz / Storz Performance. Michael Schacht of Crocker Motorcycle brought his new bike to shoot for the FastDates.com Calendars the day after the Show with Kitten Kinsey Ray. Among the Calendar Show's World Premiers this year was the first showing of the newly reborn Crocker Motorcycle, produced by Michael Schacht of Crocker Motorcycle Company, this new production bike, built to the original designs, is now available for sale. It's a true replica of the original 1936 high performance Crocker V-twin machines of which only 200 were built. 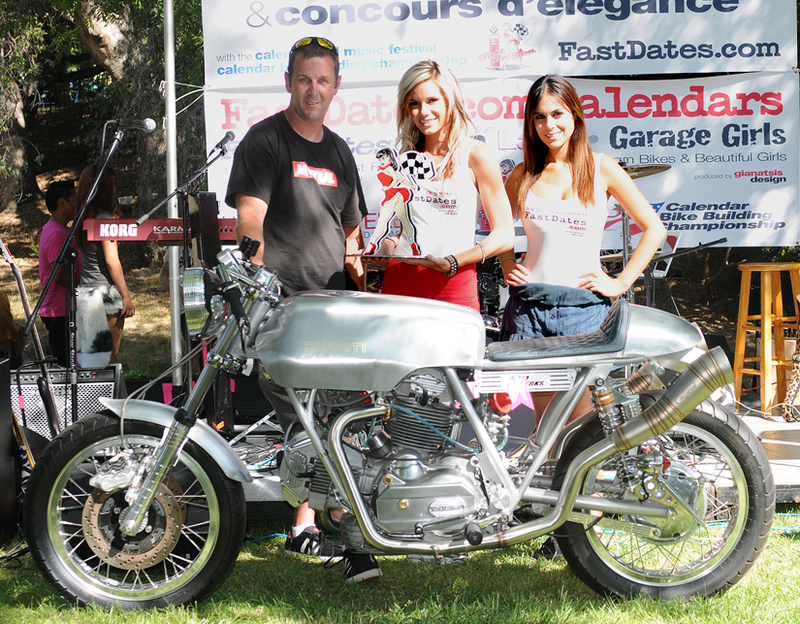 Chris Redpath / MotoGPwerks.com 1st Place Classic Metric with a Ducati Bevel Drive Cafe Bike built for Tom Cruise. Chris Redpath of MotoGP Werks used the Show to display two really neat Ducati's he had just built for Hollywood actor Tom Cruise, one a naked Ducati MotoGP Desmosedici streetfighter valued over $100,000, and the other an old Ducati Bevel-Drive 750 custom Cafe Bike. Redpath, a former factory race tuner and now performance show owner, also brought along couple of former AMA National Superbike Championship racers, one a Mike Baldwin CB900F, the other a Matt Mladin Yoshimura Suzuki GSXR750, plus a classic Mike Hailwood type Ducati racer. For the fourth time in eight years, a top Japanese builder used the LA Calendar Show to mark his entrance onto the world stage, following in the foot steps of former Best of Show and Class winners Shinya Kimura / Chabott Engineering, Kenji Nagai / Ken’s Factory and Hiroyouki Hirata of BB Custom Factory who all flew in with their bikes from Japan just to compete at the world renoun Calendar Show. Garnering Best of Show in this year's 2012 Calendar Bike Building Championship was Hoshikawa Hideki / Asteris9.com from Miyagi, Japan who flew in to Los Angeles for just 3 days with his latest custom bike build to compete and take top honors, then fly back home to Japan. Celebrity judges Jim Gianatsis, Jim Giuffra, Chris Redpath and Michael Schacht choose Hideki's 883cc Sportster based naked custom sportbike as the most exciting, original and well constructed custom at the Show. Hideki said he built it for a customer who gave him a blank check and no instructions whatsoever, other then to ask him to build the best bike he could build. Hideki is not necessarily a sportbike enthusiast, he builds all kinds of Harley based customs, but this time he said, he wanted to concentrate on the quality of the design and build, utilizing real sportbike feel and performance for the now highly modified 1200cc Sportster engine. AFT Customs also award Hideki their own "AFT Visionary Awards Trophy" which was hand built by the spokesmodels at AFT, and award by shop owner Jim Giuffra, models and Angelea and Shelby to the one builder at the Show who they felt exhibited an new direction in custom bike building. In this case Hideki had taken a mundane, underpowered, overweight, ill handling 883cc Sportster and turned it into a1200cc highly potent, world-class custom sportbike. 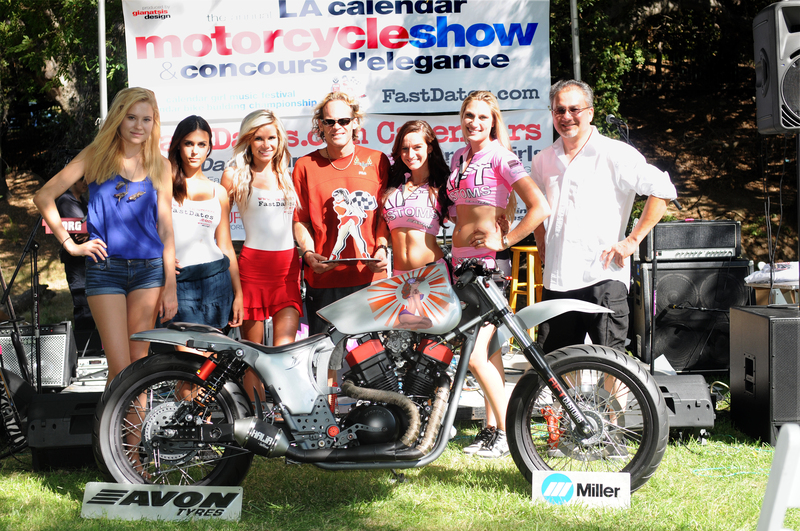 The girls from the headline Japanese rock band Nylon Pink with calendar Kittens Lindsey and Sabella, and the Yaniv Evan / PowerPlantChoppers.com 1st Plass pro Builder Class winner. 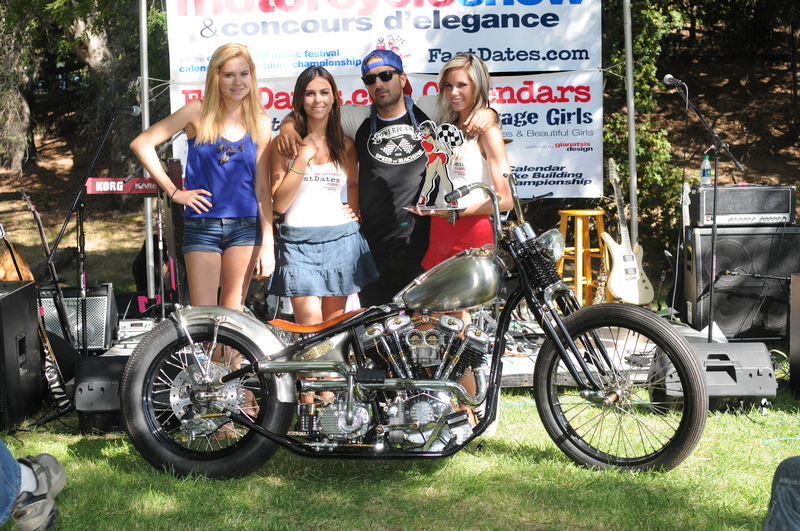 In the Pro Builder Class it was Yaniv Evan / Power Plant Choppers who took home top honors with his classically styled bare metal custom Black & Metal" based on a 1970 Harley-Davidson Shovelhead. "I wanted to build something in between a 'Rudge Superior' from the 1930's meets 1960's chopper, with a bit more power and good handlebar feel." Evan's shop PowerPlant Choppers.com is located on Melrose Avenue in Hollywood where he also sells cool PowerPlant apparel to visiting tourists and locals. FastDates.com Calendar Kittens Halle, Sabella and Kinsey, AFT's Jim, Angela and Shelby with sponsor Phillippe Danh from Frog Specialities/Beringer Brakes USA. 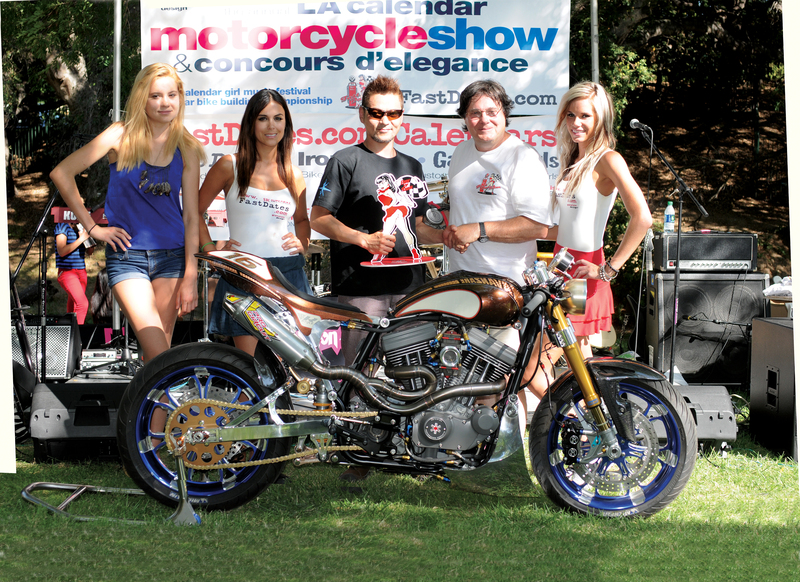 Among the Calendar Show's exciting custom bike world premiers was Two-Time Best of Show and now Six-Time Class Winners with this year's Sportbike Class victory, Jim Giuffra and the Spokesmodels from AFTCustoms.com, Jaskson, CA. premiering their latest build as always at the Calendar Show. Following their tradition of naming their bikes after spirit gods, their bike 'Halia' is a Hawaiian spirit named Honda Shadow performance custom Cafe Sport Racer that will head for the BUB Speed Trials at the Bonneville Salt Flats in August with its girl builders Angela and Shelby in the saddle for speed record attempts. 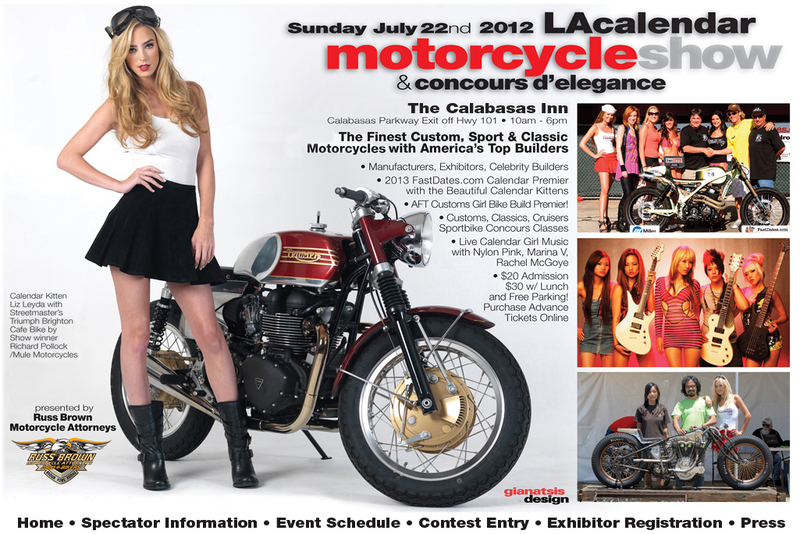 The 2012 LA Calendar Motorcycle Show's move to the new Calabasas Inn venue, proved to be a tremendous success. Everyone had nothing but positive comments about the beautiful new location, how important the Calendar Show was to the custom bike building community on the West Coast, and how they looked forward to returning again next year on the 3rd weekend of July 2013 to see the Show continue to grow as the economy recovers. The only negative note to another great LA Calendar Motorcycle Show was a protest group of about 50 bike club jacketed people on the street in front of the Calabasas Inn's main entrance during the morning hours. They were there to protest the Calendar Show's 'No Outlaw Club Colors" policy and did their best to intimidate and threaten spectators to not enter the event. 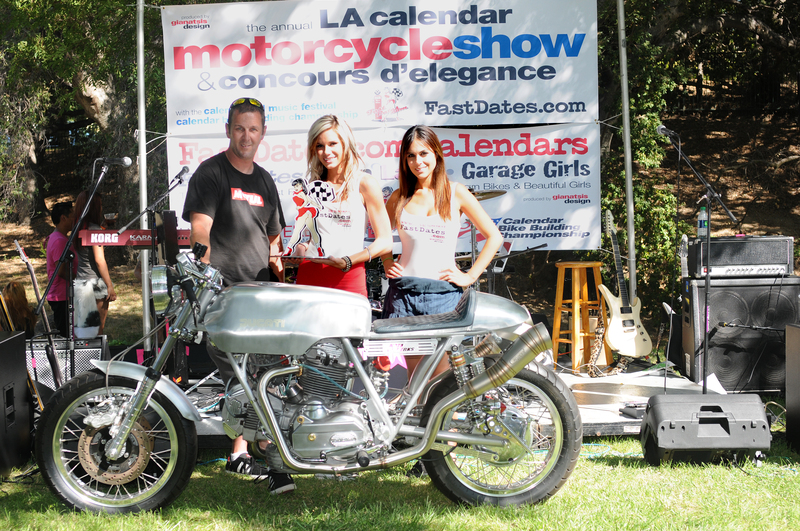 "The LA Calendar Show, like many other bike events in California," explained Show producer Jim Gianatsis, "has had a 'No Club Colors' and body search policy the last 20 years when we were in both Santa Monica and Long Beach. I was happy to relax this policy with the move to Calabasas, modifying it to just no 'Outlaw Club Colors' to reflect the continued criminal activities, murders and arrests by law enforcement of the outlaw biker clubs in Southern California. As a private event on private property, we have our own constitutional right to invite who we want to our party, and to protect those who want to come and enjoy the day. This new protest, however, was organized by a former 'peaceful' sportbike club president to who the Calendar Show had given unlimited complimentary admission and booth space to his club, and his associated clubs and members in past years, under their pretext they were supporting the sport and local charities. But this year with the move to the smaller Calabasas Inn venue, we could only offer them at 20-foot booth space for their designated charity or have to turn away paid exhibitors. In the current economy we can't afford to give all their bike club members free admission to an event that costs a lot of money to produce. We needed them to pay the low $20 admission like everyone else, while we still would help support thier charity. But this wasn't good enoogh for them, they all had to get in free or they would now boycott us. So under a vengeful, self serving banner of "bikers joining together to protect their constitutional rights" this small minded club president and his friends, and the gullible people they convinced this was some sort of justified, democratic cause, came out to the Calendar Show to harass, intimidate and try to turn away the peaceful spectators with families and motorcycle enthusiasts who also have the constitutional right not be be harassed by such people. In effect, some of these self proclaimed peaceful bike clubs have become as annoying and hateful to the community as the known outlaw biker gangs they now support. And don't overlook the harm they are doing to their own sport - the manufacturers, bike builders, vendors and sport of motorcycling in general which needs quality events like the LA Calendar Motorcycle Show to help them stay in business, attract new enthusiasts, and help keep the sport of motorcycling in America alive. These are the type of people who harm the sport, not help it." Hoshikawa Hideki / Asteris9.com brought his new bike to shoot for the FastDates.com Calendars the day after the Show with Kitten Linsey Ray. Pro Builder: 1). Yaniv Evan, Powerplant Motorcycles, HpD Shovelhead Custom; 2). Andy Iawwacone / TDC Cycles, 1947 H-D Knucklehead custom. Street Custom: 1). Charlie Mitchell, 2001 H-D Heritage lowrider oldschool custom; 2). Doug Ide, 2009 H-D Roadglide Bagger. Bar Hopper: 1). Yaniv Evan / Scott Cann, Powerplant Motorcycles, 1951 H-D Panhed Board Track Racer replica: 2). Manuel Muller, 1967 Triumph TR7 Glitter Cycle tribute. Sportbike: 1). AFT Customs / 'Halia" Honda VT750 Street Tracker; 2). Paul Morris / P&M Racing, G2 Gangster V-Twin Street Legal Street Pro Drag Bike. Classic American pre 1980: 1). Shinya Kimura, H-D Panhead custom cafe racer; 2). Dave Destler, 1970 H-D Sportster XLH stock. Classic European pre 1980: 1). Chris Redpath / MotoGPwerks.com, 1975 Kawasaki Z1 Daytona 200 Rob North Chassis / Don Vesco race bike; 2) LACD, 1975 Norton 850 Commando. Magzine editor Brian Catterson picks up his delicious order at baby's Badass Burgers. One block walking distance from the Show and the Sagebrush Cantina! Book Your Show Travel & Reservationson Expedia!